T-Mobile offers several smartphones that support its 600MHz (Band 71) LTE connectivity, and now it’s launching a tablet that has the feature, too. The Alcatel 3T 8 is launching at T-Mobile on October 12th at a price of $6 down and $6 per month for 24 months, or $150 full retail. This tablet runs Android 8.1 Oreo on an 8-inch 1280×800 display and is equipped with 5MP front and rear cameras. There’s a 1.5GHz quad-core MediaTek8765A processor inside the Alcatel 3T 8 along with 2GB of RAM, 16GB of built-in storage, and a microSD card slot. Powering the whole package is a 4080mAh battery. Alcatel touts that it’s included some custom software features with the 3T 8 that are focused on entertainment. The CloserTV app gathers apps like Netflix, Hulu, Amazon Video, cable, and satellite TV into one app to help you easily search for and view content across all your services. There’s also a built-in Kids Mode with a parental control panel to set usage time limits, select which apps your child can use, and utilize smart power saver settings. 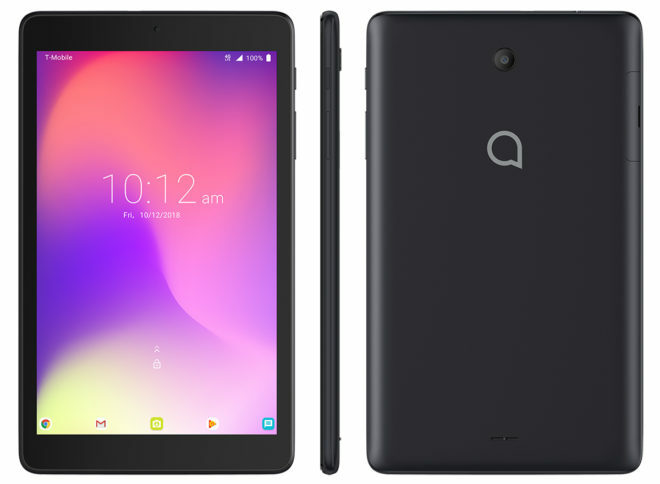 The Alcatel 3T 8 may not be a super high-end tablet, but it is an affordable option for folks who just want a simple tablet for watching videos on the go. Plus, it’s good to see a new tablet hitting T-Mobile with 600MHz LTE support. If the Alcatel 3T 8 interests you, keep an eye out for it later this week. And that resolution..maybe to keep tykes pacified. Save for the Lte connectivity(band 71 great, so is that combo app btw), I bought better, larger AND cheaper half a decade ago. Yep, unusable with those specs. My girlfriend just got a new tredmill with iFit. It requires a tablet. This might be simple and cheaper option . I wonder how much the line is? The unlimited plan is $75.00 a month,but if she has t mobile plan,they take $50.00 off,the price drops to $25.00 plus another $5.00 come off with auto pay. If you’re just getting it for the treadmill and/or for use around the house then you’d probably be better off getting a WiFi only tablet and skip paying for cellular service. Sir StephenH,has good idea,go to Ebay,and Swappa,checkout the non-lte tablets,if she is just going to use it for the treadmill,and around the house,that a better option,you can get really good deal on the Samsung Galaxy Tab A,for really good price,or you can go to Barn&Noble’s get their tablet(Yes they made one)for $50.00 plus tax,not Samsung Nook. Not sure how good the B&N tablet is. I feel like tablets are marketed towards kids and older adults who are looking for a traveling alternative to their computer, primarily for checking e-mail while on vacation. That’s unfortunate for people like me who are heavy tablet users. I use primarily for consumptive activities — setting it up in the kitchen to throw on the news while I prepare breakfast for myself, setting it up next to my laptop to use for web browsing as a space-saving alternative to a second computer / monitor, taking it on the go to be able to watch sporting events while traveling, etc. It’s a little frustrating that my original Galaxy Tab S 10″ has better specs than any of the current releases. I personally think the original S was even better than the S2, which is why I didn’t upgrade (the S3 never came to TMO). At this point, I’m not even looking for the latest / greatest spec’d tablet, but there really isn’t an excuse for tablets to not at least come with equivalent specs to the old Nexus 10 (a beast in its time but now 6 years old). The iPads are the best tablets currently on the market; I just have no desire to port over to the iOS interface, especially since I have a number of purchases through Google’s PlayStore. I know that some of them are specific to Android, requiring a separate purchase for iOS. I wish someone would make respectable, cost-effective tablets biannually for Android that were not carrier exclusives. I know what you mean,The note 2014 10.1 I got off of Ebay for really good price is great. The truth tablets are not that in demand like they were years before. Moto,Toshiba,Asus,Acer,etc.stop making any kind of hign end tablets. Left the market to Samsung and Apple. Now TMO stop selling The Lg tablet,now all they have is lowend android and hign end Apple. Your best bet is either find unlocked android or buy a Surface that lte,or move over to a Fire tablet(I know not lte),or go XDA learn how to root older hign end tablet. Look like TMO is not going to get S-4,whatever Sam is calling it. The #1 problem with my Tab S is that the battery is pretty much tapped out, no longer holding much of a charge. If I can work up the motivation, I’m going to gamble on purchasing a replacement battery, tearing down the tab myself. If things don’t go so well, it’s been paid off for a while and has served its purpose — but I’m usually somewhat decent at these things. If it works out, I may look into rooting it as well since the latest Sammy upgrade slowed it down slightly when navigating the homescreens and openings apps (once opened, they’re fine). Cool,I google how installed windows os onto android tablet,it can be done,it a process those,above my ability to do it even those they give step by step instruction,stuff like that any little thing could go wrong. Pitty. This could be a decent device but 2GB of RAM and 16GB of storage make it unusable.